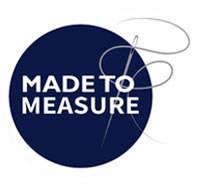 Made to Measure – our tailoring team will contact you to arrange a consultation and to take your measurements. You can place your order online or via the telephone on 01274 711 101. Inspired by the 1940s and the waisted silhouette, this beautiful tailor made Hunt Coat is guaranteed to draw attention on the hunt field. Each garment is made to measure with meticulous detail in our British factory with a complimentary consultation to take your measurements and ensure the Coat fits you like a glove. The Coat features brass buttons on the front placket, cuffs and centre back seam, a protective saddle flap, contrast upper lining in a satin twill and a tonal lower skirt lining featuring a water resistant fabric which will repel dirt and hair on those particularly wet days. Reflective under collar design which can be turned upwards if you get caught on a dusky evening. The full skirt, cinched in waist and stylish finish mean this coat can be paired with jeans and a jumper for days spent in the own or the country.